This page displays all the messages sent by users on the available auctions. To manage them, you can select 1 or more messages and click on the Publish/ Unpublish button. 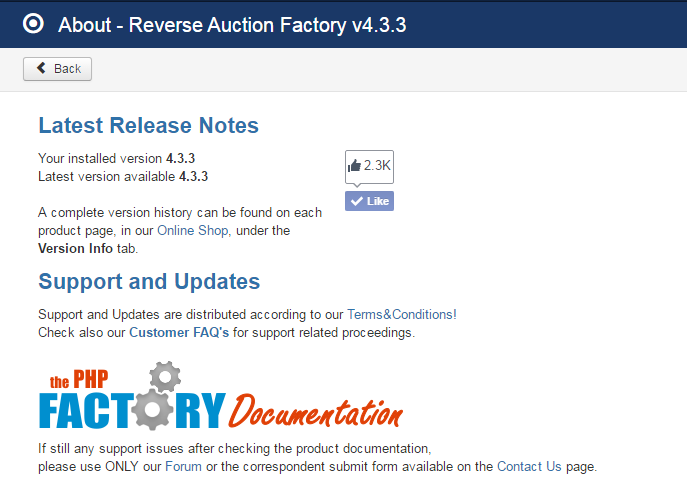 Auctioneer to bidder and vice-versa ratings can be seen in the Ratings and Reviews area of the admin. You can see the submitted review alongside the rating and the auction on which the action occurred. You can check the exact date and time of the report, a message which describes the reason of the report, the title, and it's progress. After the respective issues are resolved, you can toggle the report status to Solved. Filters are also available, which allows you to display only the solved or unsolved reports or to search after a specific username. The Statistics page shows the total number of active/expired auctions, registered/active users, messages and lists with the latest auctions and payments made. Here you can see version information and if any update is available. You will also find links to the developers and other extensions by theFactory.